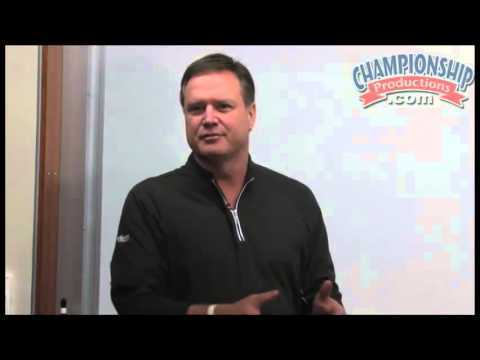 Strengthen your playbook with proven strategies from legendary University of Kansas Head Coach Bill Self. Coach Self shares two zone offenses that create scoring opportunities along with several counters that will make your offense unstoppable. With the primary goal of forcing four defenders to play just three offensive players, his zone offenses create confusion, scrambles and open shots that devastate opposing teams. In his "stationary" strategy, Coach Self uses a quick moving zone offense to create scoring opportunities in the post, utilizing the short corner to stretch the defense. Players find gaps within the defense allowing them to score around the rim or take a quick striking three-point shot. Also in this segment, Coach Self introduces the "hot potato" concept to demonstrate how to move the ball quickly against a 2-3 zone. The more intricate, equally effective "slash" strategy is Coach Self's answer to the 3-2 and the 1-3-1 zone defense. In the "slash," Coach Self uses three cutters to fill four open spots along the perimeter. Primary and secondary cutters are used through the lane to create an element of surprise. Coach Self uses 5v5 demonstrations to teach his young team how to expose the weaknesses of a 2-3 zone. Coach Self completes this package by demonstrating the Kansas press offense, which any team can use against a zone press. Your team will dissect your opponent's pressure defense by taking advantage of the middle of the court, allowing you to score layup after lay-up in the open court. This is a great DVD to add to your collection if you are looking for a zone offense that attacks your opponent's weaknesses and creates scoring opportunities around the rim. This item also belongs to the following series!